Warning- very heavy graphics post! 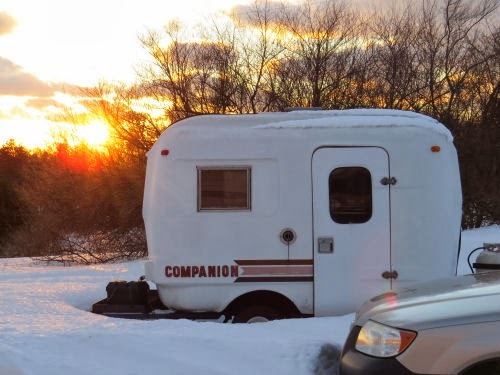 Since I bought it, I've had the opportunity to take my little trailer out on two multi-day trips, so I know much more clearly the things it needs to have done to make it really livable. Today, I made a real list of the things that have to be done. The really serious item is the door. If you look closely you can see that the door is not hung straight. This is because they tend to sag over time. A closer look around the hinges reveals that they have been re-positioned once already. The most serious issue is that the bottom is sprung out on the latch side. 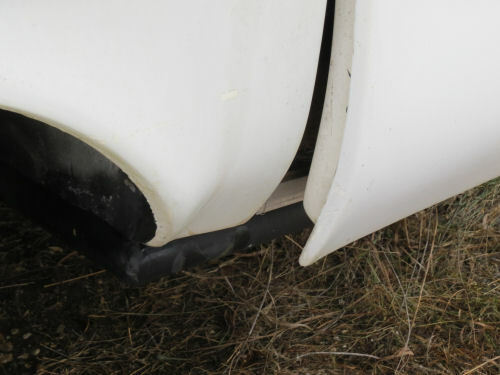 I've looked up the fixes for this and they involve a lot of serious fiberglass work. I've never done anything beyond some patches on canoes, so I may need someone to do this for me, if I decide to fix it. 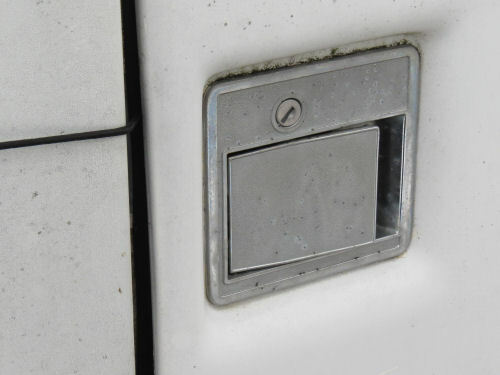 The door latch does not catch properly because it no longer reaches to the lip where it's supposed to catch. I have "fixed" that by slipping a piece of metal behind the seal to extend the lip. Only a temporary solution at best. Re-hanging the door may take care of that. if not, I'll have to figure out something else. And the door needs a whole new seal. 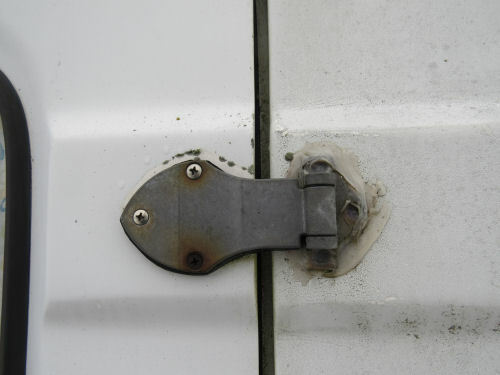 Another issue with the latch is that I have no key, which means I can't lock the trailer. If I'm going to travel with it a lot, I want to be able to do that. Replacement latches can be purchased, so that will be on my list. The windows are original and flimsy. They crank out with a screen inside. However, none of them leak and the screens are in good condition. We learned that we actually like them in rainstorms because they can remain open for ventilation and the rain does not blow in. They won't be changed. This may be hard to tell what it is. The shot is looking up at the roof vent. 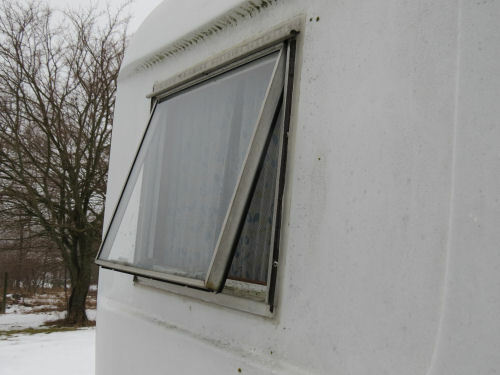 It works fine but the screen frame is badly warped- almost as if it melted from too much heat which makes no sense because we learned last summer that these trailers don't heat up as much as metal ones. I hope I can get a replacement screen in the same size. 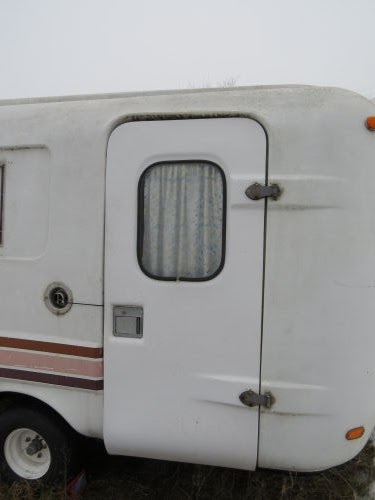 Finally, the exterior has become chalky, as all of these fiberglass trailer surfaces do over time (the title says this one was built in 1984). 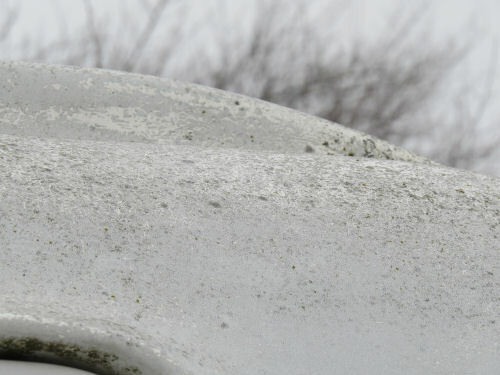 This roughened surface encourages mold to grow. So the trailer needs a good exterior cleaning, and eventually painting. There are products made for this. When I bought the trailer, I thought the biggest inside issue was going to be a "so what" kind of thing. I have learned that it is much more critical. 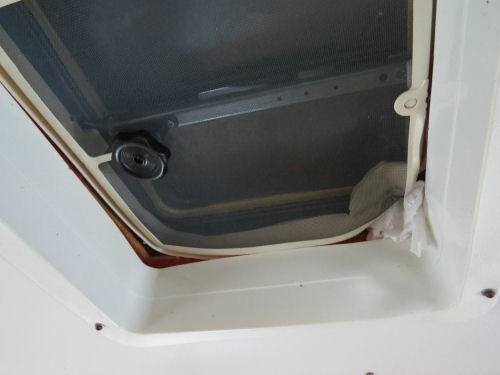 The previous owner removed all the interior coating and just painted the inside surface that pinkish-beige color. 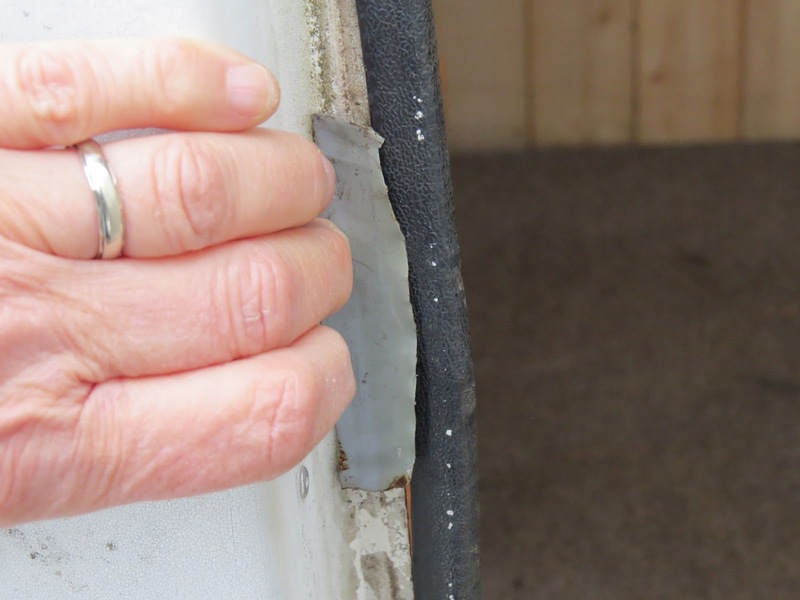 The problem is that this leads to interior condensation. Serious condensation- almost interior rain. This must be fixed. 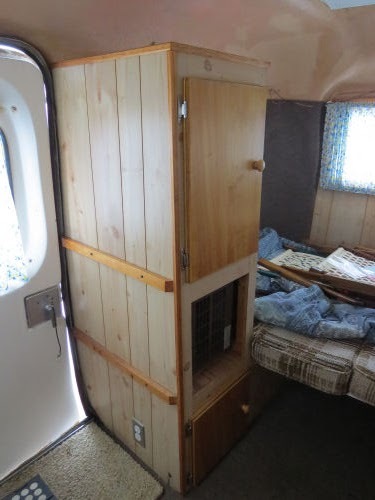 After visiting the Scamp Factory with Lyle I know just what to do, but the interior will need to be gutted first. What has to go? 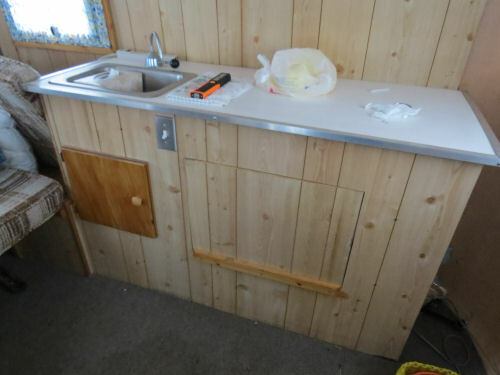 This kitchen unit is coming out completely and will not be returned. It's too wide, too heavy, is positioned poorly, and has no usable spaces. 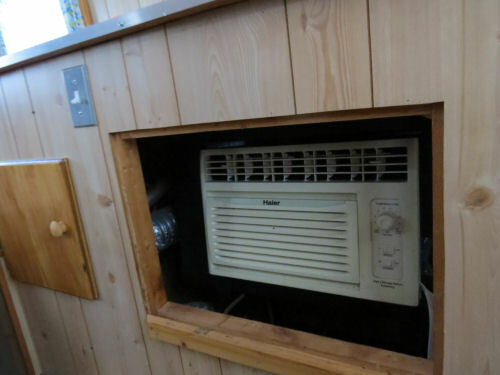 In that kitchen unit is an air conditioner. It just takes up too much space. It's leaving. I'll get a tower fan. This cupboard is marginally tolerable, but it will need to come out to add the insulation. Since I have a new floor plan pretty much settled, this won't be returned. 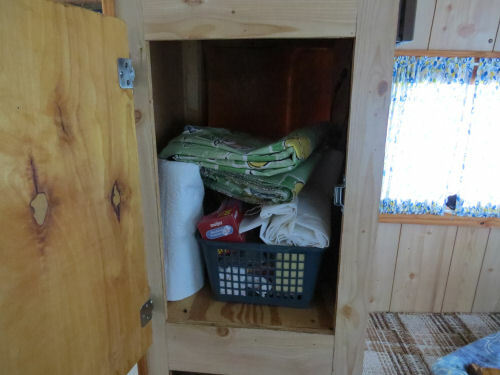 The upper shelf is the one real bit of storage in the trailer now, but even it would be more useful divided into at least two shelves. 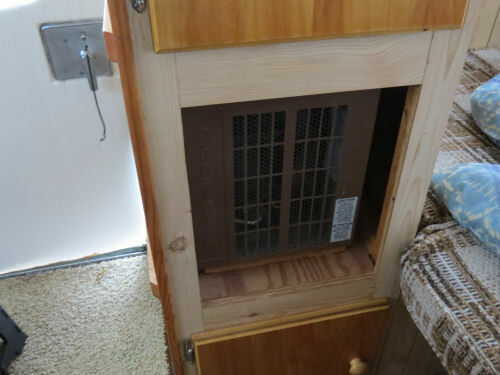 The lower portion of the cupboard holds a small furnace, which takes up another big space. That's not being kept either. I have already purchased a small ceramic heater which I can just carry with me on trips when I expect to be chilly. 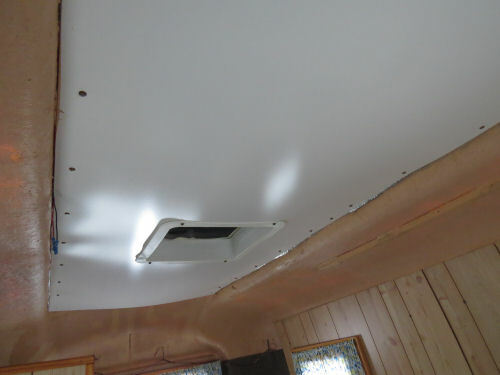 Looking up at the ceiling, the previous owner apparently did some minimal insulation which he covered with masonite paneling. Since I don't know for sure what's behind that it will have to come down. I want the new insulation to be the same throughout anyway. 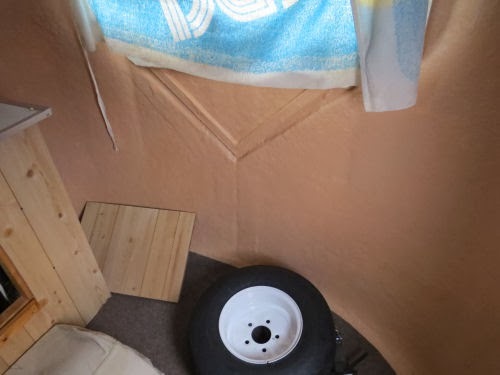 I've also learned that it was a real mistake for all the built-in cupboards to be removed because they are made to provide extra support to the fiberglass shell which is too flexible to remain indefinitely with no support. In fact, that may be part of the trouble with the door. My interior plan will restore several points of upright support. That's more than enough for this post, but I've been having several quality days (and nights with no sleep because my brain has entered trailer planning mode) thinking through all these things. Sounds like a big challenge, but opens up such opportunities! I'm thinkung you're going to have a lot of fun with this, even if you also have a little bit of frustration too. Looks like a major project in the works for you. Wow, you've got your work cut out for you, Joan. I admire your stamina and courage but I think it'll be great when you finally get the work completed. It may be a big project, but have you priced the new ones?? It's CRAZY!! I want one, either way. I can't wait to see what you do with it!